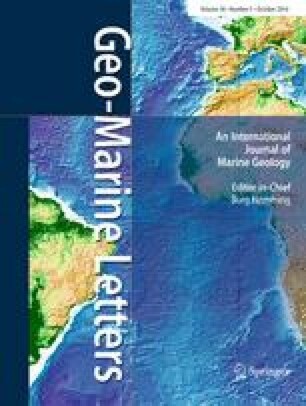 This study aimed to constrain the source area of fluids responsible for the formation of a pockmark field in the eastern Red Sea. The newly discovered field extends over an area of at least 1,000 km2 at a water depth of ~400 m. The pockmarks have modal diameters of 140–150 m and are either randomly distributed on the seafloor or aligned within valleys approximately 25 m deep and several kilometres in length. Seismic data show that chimneys and/or regions of acoustic turbidity prevail beneath the pockmark field down to the top of Miocene evaporites, which are widespread in the Red Sea. Four gravity cores were taken from the pockmark field. For most of the cores, geochemical analyses show that porewater has a higher Cl concentration than the local seawater and increased Cl/Br ratios, which indicate an origin from evaporites. The adsorbed hydrocarbons are of thermal origin, with C1/(C2+C3) ratios between 4 and 23 and stable carbon isotope data for methane varying from δ13C of –34 to –36.4‰ with respect to Vienna Pee Dee Belemnite. On the basis of the calculated maturity of the source rock of 1.2–1.4 Ro, local thermal gradients and sedimentation rates, its deeper depth boundary is approximated at 2,000 to 2,200 m. The results indicate that the adsorbed hydrocarbons sampled at the seafloor had to pass through an evaporite sequence of potentially several hundred metres to a few km in thickness. The most likely explanation for the increased permeability of the evaporite sequence is brittle deformation triggered by extensive local tectonic movements and supported by high fluid overpressure within the evaporite sequence. The efforts of the captains and crews of the research vessels Poseidon and Pelagia during our surveys is much appreciated. We wish to thank Neil Mitchell, Najeeb Rasul, Ian Stewart, the editors and reviewers for helpful comments. This work is the result of the Jeddah Transect Project, a collaboration between King Abdulaziz University and GEOMAR Helmholtz Center for Ocean Research that was funded by King Abdulaziz University (KAU) Jeddah, Saudi Arabia, under grant no. T-065/430. The authors acknowledge with thanks KAU technical and financial support.